Do You Like McDonald’s Apple Dippers? 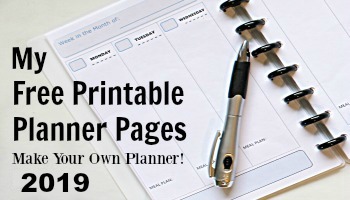 Try Making Your Own! One of the frustrating things about having a sliced apple for a snack is that they can start turning brown so quickly. And once they start turning brown, well, they just don’t look as tasty anymore. But guess what? There’s a simple and easy trick for keeping those apple slices looking like they’ve just been cut even after several hours have gone by. Simply soak them in Sprite, 7-Up, or Gingerale. Store brand lemon lime soda works just fine and dandy too! Learning this little trick was exciting news for me because I’m kind of a sucker for the Apple Dippers at McDonald’s. When they were first introduced on their menu I thought it was pretty cool that McDonald’s had discovered some magical way to keep their apple slices fresh. Turns out I can do the same thing at home and Make My Own apple dippers. Yay! 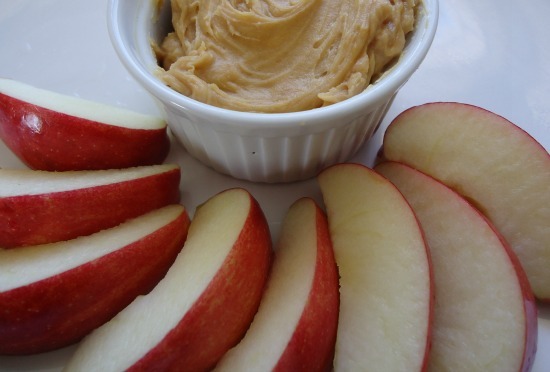 And when I make my own, I substitute a healthier peanut butter and yogurt dip instead of the gooey sweet caramel dip that you get with the McDonald’s Apple Dippers. 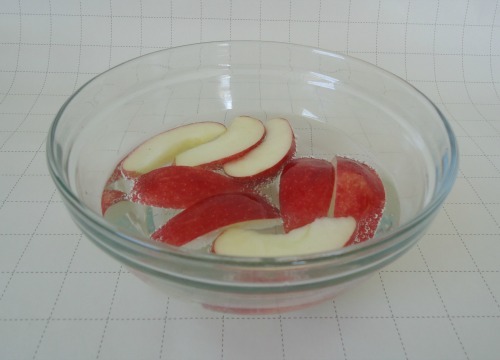 Slice up your apple and put the slices in a small bowl. Pour your 7-up or other lemon lime type of soda pop over the apples to cover them. They will want to kind of float a bit, so just make sure all the slices have had some contact with the soda pop. Let them soak for about 5 to 10 minutes. Discard the soda pop once they are done soaking. Now your apple slices will stay fresh looking for several hours. You can pack them in a lunch for the kids (or yourself) and they will still look and taste good after several hours have gone by. The apple slices take on just a tiny bit of the taste of the 7-Up but it’s really barely noticeable. You can pair your homemade Apple Dippers with this easy dip that’s a healthy alternative to the caramel dipping sauce for apples. Place the peanut butter and the yogurt together in a small bowl and stir until they are mixed together. The proportions in the recipe above make a small batch that goes well with dipping for one apple. If you want a bigger batch, you can adjust the size of the recipe by simply mixing together equal amounts of the peanut butter and yogurt in the measurements needed. And one final note . . . . I tried to be frugal and drink the 7-up that the apples had been soaking in, but – Blech. It’s flat and doesn’t taste quite the same. It’s best to just toss out the 7-Up once the apples are done soaking. Yes, you can substitute diet 7up or gingerale. Most any of the clear sodas, like Sprite or 7up, will work. I know that the apple slices will keep at least for a day. I have always eaten the slices within the same day (because they are yummy!) so I can't say for sure if they would keep a day or two longer. Could I substitute diet 7up or ginger ale? How long wil it keep? When good tart apples are in season (Jonathans, preferably) I pull out about 10-12 Kraft (Milk Maid) Caramels, unwrap, drop into a saucedish or custard cup, add a tiny bit of milk or water, and a dash of salt. Microwave 30 seconds, stir, repeat, watching carefully so it doesn't boil over, and you have lovely, lovely caramel warm caramel dip. If you make it a little thinner, it will still be dipable when it's cold. I have tried this and it DEFINITELY works! Thanks! That's a great tip and I had no idea myself. I always hate the way apples get browned after they have been sliced and then no one wants to eat them.